The Plateau Passage is an adventurous, remote, and challenging journey from Las Vegas and the low Mojave Desert, over Utah’s central High Plateaus, and across the breathtaking and immense Colorado Plateau. The route climbs over isolated desert mountain peaks, meanders through canyons, passes through the mountain bike mecca of Moab, and then aims for the western edge of the Rocky Mountains. The final segment of the route negotiates several passes over 12,000 feet in elevation in the magnificent San Juan Mountains before descending to the eastern terminus of the Plateau Passage in Durango, Colorado. The goal of this route is to highlight the immense tracts of amazing public land in this region, experience the ecological and geological transitions onto the Colorado Plateau and then into the high San Juan Mountains, and provide the opportunity for an isolated, solitary bikepacking experience in a region so devoid of communities and population centers. The Colorado Plateau landscape has inspired countless cultures, explorers, environmentalists, adventurers . . . the list goes on. This is one of the most special places in the American West, and it’s one that deserves to be appreciated, understood, and preserved. The designed riding experience caters to mountain bikers – riders who enjoy backcountry singletrack, don’t mind some hike-a-bike occasionally, and relish seldom-ridden terrain. But that being said, this route is only ~20% singletrack due to the paucity of trails in this region. Linking up sections of trails are dirt roads and rough 4x4 tracks. And in regions carved up by canyons and impenetrable topography, occasional pavement riding is required. So while this route is dominated by faster riding on gravel roads and some pavement, do not underestimate the challenge and rigor of the 4x4 trails and singletrack that together make up half the route by distance. In this guide, we first provide some general information about the route as a whole. Then each of the six segments of the route are described in detail, and detailed turn-by-turn directions are also provided. However, we strongly recommend that all riders taking on the Plateau Passage use the supplied GPS data for navigational purposes and the turn-by-turn directions as supplementary information and as a back-up navigational aid. ● If this route isn’t enough, riders can connect to the Colorado Trail in Durango and continue onward to Denver! ● This is a challenging route with limited resupply options, limited water, and some very remote country. Don’t take any of these facts lightly. In order to tackle this route, you should be an experienced bikepacker with trip-planning and riding experience in the desert Southwest. ● Ideal time of year (and potentially weather conditions): Late May to September. The Utah’s high plateaus (>10,000’ in elevation) can hold snow well into May and the high mountains in Colorado may be impassible until mid-summer. In June, the high plateaus and mountains will still be relatively cool (highs in the 60s to 80s °F), but the lower elevations will be hot highs of 90 to 100+ °F. Late summer monsoon thunderstorms can turn some sections of the route into impassible mud. And by September, sub-freezing nights and potential snowstorms return to the high elevations. ● This route begins at the Las Vegas International Airport and ends in Durango, Colorado. There are numerous transportation options into and out of both towns. ● From Durango, riders could continue northeast on the Colorado Trail to Denver. There is virtually no overlap between the Plateau Passage and the Colorado Trail routes. ● The Robertson Pasture Trail high in the Abajo Mountains (Segment 5) is closed to bikes from October 1 to May 15. A detour is possible by staying on Hwy 101 until just past Harts Draw Overlook and rejoining the segment at Spring Lake. ● As state above, water sources on this route are limited and include many stock tanks that are most reliable in late Spring and late Summer. Waypoints for these are provided with labels like “poor” (unreliable, likely silty) and “good” (more reliable, cleaner water). DO NOT plan that every stock tank will have water, and carry more water than you expect to need. Water from some stock tanks is often silty and will clog water filters and is not amenable to UV water treatments. Carry a means of chemical water treatment like Aqua Mira or iodine, and have the ability to carry at least 2 gallons of water. ● Beware of show-stopping mud during and after storms. Many sections along the entire route are subject to this - see detailed segment information for more details. ● The Virgin River Rim and Navajo Lake trails above Cedar City, UT (toward the end of Segment 2) are often blocked by spruce deadfall in the early season and may not cleared by the USFS until late June. Contact the USFS office in Cedar City (435-865-3200) to check on the condition of these trails. And the Grandview Trail on the south side of the Paunsaugunt Plateau can face the same issue. Call the USFS office in Escalante (435-826-5499) for an assessment of current conditions. Detours are possible if needed. ● Beware of flash-flooding during and after storms. Never camp in dry washes. 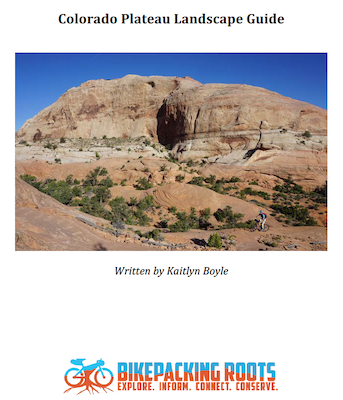 The Plateau Passage began with Dave Harris’ vision of a TransUtah bikepacking odyssey connecting St. George to the Colorado border east of Moab. Dave devoted several summers to extensive exploration and reconnaissance, ultimately developing a stellar route that reached as far east as Boulder Town. Kurt Refsnider subsequently pushed the route farther east, scouting several possible options to get to Moab and then southeast into the San Juan Mountains of Colorado with trail recommendations from Fred Wilkinson and Scott Morris. The final link between Las Vegas and St. George was finalized in 2017 by Kurt with additional suggestions from Dave. This dirt road/pavement reroute beginning at mile 191.6 and ending at Boulder Town, the end of Segment 3, bypasses trail no longer being cleared of deadfall by the USFS. Carrying detailed topographic maps in this rugged, remote country is highly advised. 640 million acres of land in the United States are public – owned by the citizens and managed by the federal government for multiple uses. These lands include forests, mountains, rivers, canyons, deserts, plains and include hundreds of thousands of miles of trails and dirt roads.Public lands are where we bikepack and these lands are under attack. Special interest groups and their political allies are on a campaign to transfer federal lands from the American public to the ownership of states. This land transfer threatens hundreds of millions of acres of protected land, an American fundamental value – that public land is ours – and it threatens the future of recreation and access to the land through which we bikepack. The Plateau Passage crosses over 1,200 miles of the Colorado Plateau landscape. Long distance, dirt-oriented routes are only made possible by access to public, federally managed land. The Plateau Passage is entirely dependent on the public land it traverses – this includes four National Forests, extensive Bureau of Land Management lands managed by numerous field offices, two National Recreation Areas, three National Parks, and two National Monuments. *As of April 26, 2017 the National Monument designations since 1996 are being reviewed, including at least 27 National Monuments, including the two the Plateau Passage visits. While the conservation issues of the Plateau Passage are far reaching, the review of National Monument designation, enacted by executive order by President Trump in April, 2017 is the most consequential. This review has resulted in the recommendation by Interior Secretary Zinke that the Monument be reduced in size by nearly 90%, and in December, 2017, Trump has ordered that to happen despite widespread opposition both within Utah and nationally. For this reason, the only issue we will currently present and strongly encourage action on relevant to the Plateau Passage is the review of the National Monument designation, particularly of Bears Ears National Monument. Riding the Plateau Passage, you will likely spend several days traversing this new national monument.Bears Ears National Monument is unique in that its designation on December 28, 2016 by President Obama was the result of the advocacy of an inter-tribal coalition comprised of five tribes. Bears Ears protects one of the most significant and rich cultural landscapes in the country, with cultural artifacts, history, and sacred sites to many Native American tribes. The 1.35-million-acre Monument is also a part of the vast, remote, wild landscape of the central Colorado Plateau. Its physical and biotic landscape is rich and inspiring, and as such, the landscape supports diverse recreation opportunities. For a visually compelling story sharing the uniqueness of Bears Ears, visit this interactive website developed by Patagonia sharing more about the Bears Ears region. The Bears Ears National Monument designation was based on the Antiquities Act of 1906, an act that is among the most influential conservation tools in America. The Antiquities Act enables presidents to protect landscapes and sites for “historic and scientific interest.” Trump’s executive order to review and potentially undo National Monument designation is an unprecedented attack on American conservation values, tradition, and law. If you are inspired to someday experience the quiet roads and trails, clear and expansive views, natural wild beauty, and natural and cultural history of the Plateau Passage, please voice your support for Bears Ears National Monument. Individual and unique stories hold the greatest weight in public commentary – visit Outdoor Alliance to voice your support and share your stories for the Bears Ears. And, call your local government officials to share your voice. The Bears Ears/Patagonia story site’s chapter on Take Action will connect you.